So, I finished up most of the border of the Swallowtail Shawl at the first Book Club meeting at Large Marge’s on Friday evening, and then did the bindoff yesterday. Today? Oh, and thank you all for the words of commiseration and encouragement on the biking adventure. I appreciate that it’s something a lot of people enjoy, but this was far beyond just me being out of shape – I was really, really terrified – and that was the same whether we were on the bike path along the road or through the little bit of woods. There are enough other options out there for workouts that I have no problem with the idea of never getting on a bike again. In fact, it’s rather appealing to me. Plus, the bike was a loaner from Mary’s neighbor, so it’s not like I bought it and it will sit there judging me if I don’t ride again. We have a stationary recumbent bike, and if I can find a space for it in the living room (it’s in the garage at the moment), I may start doing a little of that to break up the walking. 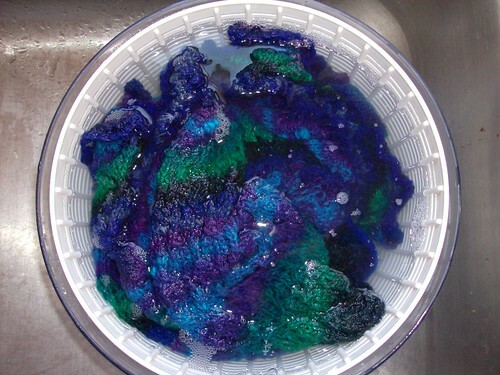 March 22nd, 2009 | Tags: FOs, Knitting | Category: Misc. Swallowtail is gorgeous! And don’t fret over the bike thing. It is not for everyone. Is that a salad spinner? Shawl looks very nice. Good luck on the exercise. Once I get through Hubster’s shoulder surgery tomorrow, I hope to join you on that routine. It is beautiful. And mine is in some Noro also. Must just do it! 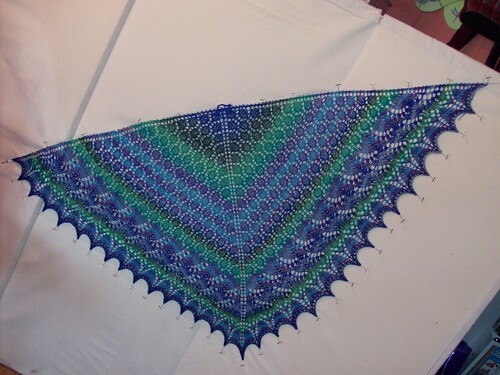 That’s one seriously GORGEOUS shawl!! And you’re right, there are so many options other than biking, you don’t have to feel bad about not biking again! Beautimous! I love the stripies. Beautiful! I love that pattern. Ohhh, that is beautiful work! Those colors are delicious, too. That is beautiful, and I love the colors! Well done. Oh that is sooooooo pretty! Beautiful! I love how the stripes came out. Oh my that is a beautiful piece of work. Oh, and about the bike??? I HATE to bike and would NEVER get on a bike again!!! I care too much about the health and well being of my body to get on a bike! I do like “spinning” class. It is a great workout on a bike without moving along a road (except in the imagination of the instructor). Absolutely gorgeous. I love the colors. How big was it when you pulled the pins? Geeeeyourgeous! That colorway just kills with the increases in the pattern. I have yet to knit a swallowtail. I need to join the legions.